This must just be the shock of the day but it is real. 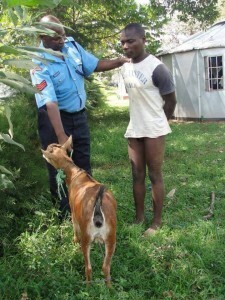 A boy was arrested during the day as he was caught messing up a goat. The owner of the female goat left his goat out grazing when the starved man came across it. He took the goat to a hidden place and started working on it. By bad luck before he was done passersby heard the goat scream and the man was like also enjoying the moment and now he too was screaming out of sweetness. The men came to the rescue of the goat when they were shocked to find the man working on the goat. There is where he was arrested and taken to the police station. What kind of journalism is this? Poorly concocted story. Where and when did this happen? FOM be serious before you upload these stupid stories.